The 2015/16 Bundesliga season is now at the halfway stage, providing the ideal time to take stock of each club's progress so far. Here, bundesliga.com puts Eintracht Frankfurt under the microscope. Armin Veh's return to the club he had guided back into the Bundesliga and then into the UEFA Europa League saw hopes rise in the summer after that spark had been missing under Thomas Schaaf last term. It took a while for the Eagles to find that spark, but something happened between Matchdays 3 and 4 with ten goals scored and three conceded, with back-to-back wins over VfB Stuttgart and 1. FC Köln. It proved to be a false dawn, however, with just one more win coming from their next 12 games, prompting a worrying slide down the table which was reversed just in time prior to the winter break with a 2-1 win over SV Werder Bremen. That result will ensure a more serene few weeks before the action kicks off again in 2016, with the Eagles looking to fly clear of the bottom three sooner rather than later. No side has scored more goals on the counter-attack than Frankfurt (seven).At only two other clubs do midfielders have a better shots-per-goal ratio than at Eintracht. The Eagles' men in the centre of the park have needed just 7.8 attempts to score. 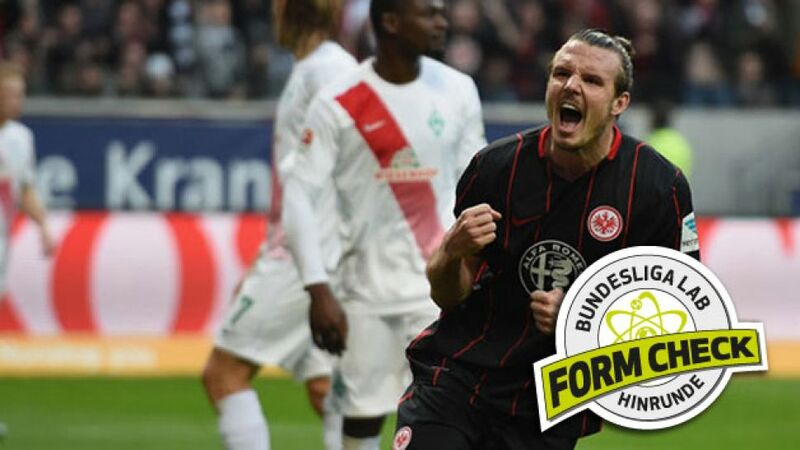 While Alexander Meier may not have scaled the heights he reached last season when he became the Bundesliga's top goalscorer, the 32-year-old remains Frankfurt's key attacking weapon. He has seven goals to his name – including a maiden Bundesliga hat-trick against Köln on his first league appearance after five months out with injury – and ended the Hinrundeon a high with goals away at Borussia Dortmund and at home to Bremen on Matchday 17, the latter strike helping Eintracht to a first win in six games. Follow Eintracht Frankfurt's ups and downs over the course of the first half of the season in our interactive league table. See an Alexander Meier-inspired Frankfurt demolish 1. FC Köln on Matchday 4 in this video.